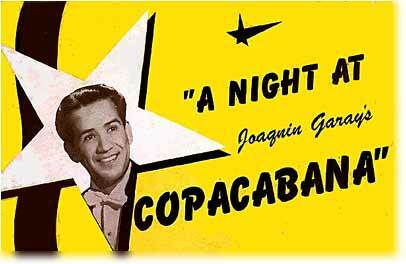 Joaquin Garay was a well-known San Francisco radio and night club entertainer from the 1940s into the 1960s, and operated the glamorous Copacabana night club, 2215 Powell Street at Bay, during World War II. The club, which opened September 1941, was popular with Hollywood stars who frequented San Francisco. Humphrey Bogart and Lauren Bacall frequented the Copa during their honeymoon stay here. San Francisco Independent columnist Jack Rosenbaum, in 1995, said Joaquin Garay later moved to Los Angeles. Located on fabulous Fishermans Wharf in San Francisco, city of cable cars and night clubs, is colorful COPACABANA. Called COPA for short, folks find the singing of a favorite son, and the rhythms of a favorite maestro, very much to their liking, anent the fact that over a half million minimum charges have passed through the Copa bookkeeping records since 1941  the year COPACOBANA was born. Joaquin Garay had been a well-known radio personality in San Francisco and starred on KFRC's broadcast "Feminine Fancies" in the 1940s. He also helped the war effort in San Francisco by entertaining at USO functions. Hear a portion of Joaquin Garay's recording of the tango "Adios Muchachos," better known as "I Get Ideas," from the album "A Night at Joaquin Garay's Copacabana,"